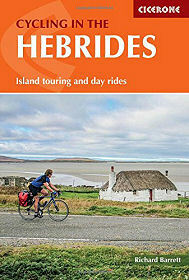 "Cycling in the Hebrides" by Richard Barrett is a lovely little book that will prove an indispensable companion to anyone cycling in the western margins of Scotland: or, indeed, to others touring the area using less energetic and less virtuous modes of transport. Potential readers should bear in mind that some of what makes the book so outstanding is that its title suggests less extensive coverage than you find once you start to delve within. "Cycling in the Hebrides and the Western Seaboard of Mainland Scotland" might have been a more accurate title, but it's not nearly as catchy and we accept it would have been difficult to fit on the cover. The format of the book is a tried, tested and very effective one. An introductory chapter covers subjects like transport to and from the area, planning for your trip, accommodation, bike preparation, packing and so on. There are also a series of appendices summarising routes, suggesting tours, listing cycle shops, hostels, day trips to islands, and more. But the real meat of the book, as with any Cicerone guide, comes when you begin to get into the chapters detailing routes in particular areas. Clear and helpful maps are accompanied by informative gradient tables, text descriptions, overview sections and excellent photography. The routes within the book tend to be of two distinct types: circular routes on Hebridean islands, and "link routes" that can be on islands or on the mainland. A good sense of how this works in practice can be gained from the chapter covering "Skye and Raasay". Seven routes are provided on Skye, and another on neighbouring Raasay, and between them they give anyone using the book an excellent sense of what the two islands have to offer. But in some ways anyone new to Scotland will find the two link routes provided in this chapter at least as fascinating. The first goes from Ullapool around the coast of Wester Ross via the bridge to Skye, and then the length of the south east side of Skye to Armadale. The second leads you from Stromeferry to Glenelg, then uses the ferry to cross to Skye before leading to Uig. The first of these routes, in particular, takes in some of the most stupendous scenery that mainland Scotland has to offer, and the presence in every chapter of link routes does much to expand the scope and value of this excellent book.